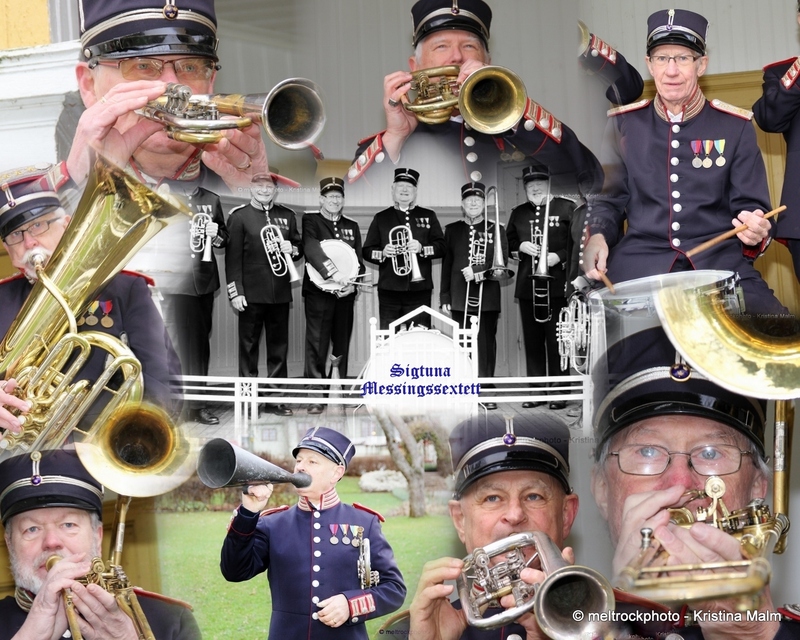 The Sigtuna Brass Sextet, a non-profit organisation since 1967, originating from the oldest municipality (980 A.D.) of Sweden is dedicated to maintaining the rich brass traditions established since the early 1800’s in Sweden. Often military trained, brass musicians established a broad cultural function providing music for a village Saturday night dance, Sunday morning church service, Sunday afternoon park music, holiday festivals, government and formal ceremonies, entertainment programs, special theme concerts, school commencements, weddings, funerals, anniversaries etc. The sextet wears the Swedish military captain’s uniform from the late 1700’s. Unique are the three buttons on the sleeves which represent the three kingdoms of Sweden at the time – Sweden , Norway and Finland . When the Swedish army surrendered to the Russian army after a brief battle outside of Helsinki , Finland in 1809, Finland was released to Russia . Many of the Swedish officers did not support the surrender and the habit of moving one button on the sleeve was adopted awaiting the reinstatement of Finland to the Swedish Kingdom. Sigtuna Brass Sextet also has a modern sports jacket with a golden ascot for suitable performances. Sigtuna Brass Sextet is a 100% environmentally friendly organisation. Since 1967 it has focused on an alternative energy source called recycled wind power which in coordination with lip vibration in contact with brass instruments produces a musical effect proven to be at least 50% more enjoyable than the traditional fossil energy based electrical music. Current rules for recycling state that products from recycled sources are considered junk and not suitable for consumption. Since the efforts of the Sigtuna Brass Sextet have from many sources confirmed the enjoyable results of their efforts they applied for a REACH permit 5 years ago which allows that products (music) from recycled wind power may be utilized publicly as their product meets at least the same standard as tradtional fossil-based electric music.